I was two years old when President Kennedy was shot. Even though I have no memory of it, the assassination occupies a large part of my consciousness. I first encountered the images — the smiling president's motorcade, the defiant Lee Harvey Oswald, the grieving Jackie, little Caroline and and brave toddler John Jr. saluting his father's casket, Jack Ruby leaning in to shoot Oswald — in Four Days, a white-covered commemorative book sold in our city by the Cleveland Press. As a curly-haired tot, I scribbled with a crayon on its pages. As an adult, I amassed an impressive collection of books on the assassination. Of course, I am not alone in having that permanent mental photo album, and thinking still, more than fifty years later, about the assassination and its mysteries. Pablo Larrain Matte, the Chilean film director, was not born until 1976. By his own admission, he had no historical knowledge of the Kennedy assassination when approached to direct JACKIE, a movie about Jacqueline Kennedy in the immediate aftermath of her husband's killing. (Darren Aronofsky and Stephen Spielberg both passed on the job.) The film, which was originally proposed as an HBO series, stars Natalie Portman as the bereaved First Lady. Portman is the latest in a long line of actresses who have portrayed the famous Jackie O — Jacqueline Bisset, Jaclyn Smith, Sarah Michelle Gellar, Blair Brown, Katie Holmes, et al. (not forgetting, of course, the female impersonator Divine in John Waters' 1968 Eat Your Makeup). 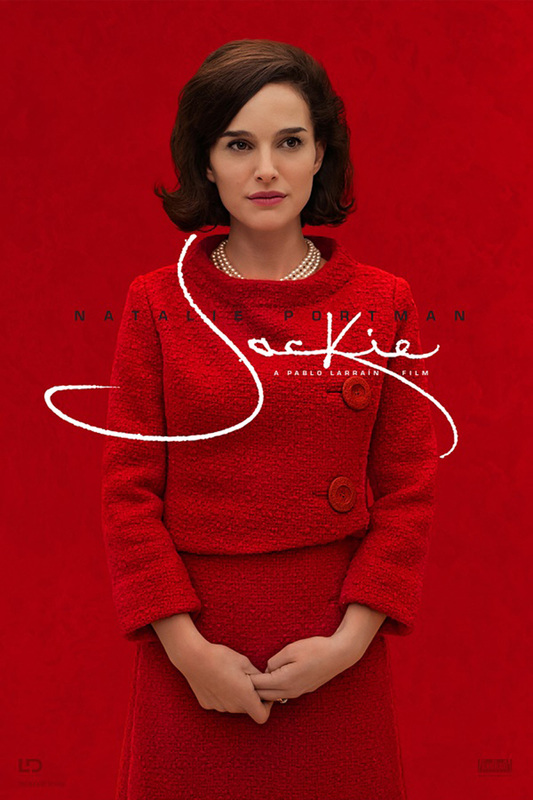 Portman spent a lot of time watching videos of Jackie and practicing, with a dialect coach, the First Lady's kitten-soft speaking voice, as well as the lower, more natural register she used in private moments. Larrain (as he is billed here) and his production staff went to a great deal of trouble to re-create, with live actors, familiar images, such as the hasty swearing-in of Lyndon Johnson aboard Air Force One and the funeral procession led by a black-veiled Jackie. Portman as Jackie is integrated into actual documentary footage. The reenactments are impressive, a little like those animatronic tableaux at Disney World. The film's premise is an interview of Jackie at Hyannis Port by a journalist, called The Journalist and played by Billy Crudup. He is not William Manchester, the writer who interviewed Jackie at length and published, amid great controversy, The Death of a President, but William H. White, who wrote a Life magazine feature about Jackie. The famously private Jackie warns the journalist (I mean The Journalist), “You understand, I will be editing this conversation,” a condition the real Jackie, along with her brother-in-law Robert Kennedy, placed on Manchester. Among the things she didn't want revealed: her smoking. Elegantly puffing cigarettes, she recounts that fateful day in Dallas: the rose bouquet she was given, her husband telling her to remove her sunglasses in the motorcade so people could see her face. And then, the gruesome horror: his blood and brains on her lap, the shattered pieces of his skull, her desperate attempt to put him back together as his head rested across her knees. “His head was so beautiful. His eyes were open. He had a wonderful expression on his face...puzzled. I tried to hold his head together. I knew he was dead.” Blood on her stockings and all over her pink bouclé Chanel suit, which she refused to remove. “Let them see what they've done,” she said. The film depicts the awkwardness of Jackie's position in the White House, which she is expected to vacate quickly for the incoming Lyndon and Lady Bird Johnson. The new president and First Lady are already, figuratively speaking, measuring the drapes. Eleven days after the funeral, Jackie Kennedy went to live at her temporary home in Georgetown. Before leaving, Jackie, ever mindful of history, had a plaque installed in the Lincoln Bedroom that read, poignantly, “In this room lived John Fitzgerald Kennedy, with his wife Jacqueline, during the two years, ten months, and two days he was president of the United States.” (The plaque was later removed by the Nixons — not surprising, since the wealthy, popular JFK was Richard Nixon's lifelong bête noir). Jacqueline Kennedy, along with her slinky 1970s iteration, Jacqueline Onassis, may be the most famous unknown person in history. Notoriously protective of her privacy (remember Ron Galella, the photographer she sued over his obsessive paparazzi photographs of her? ), she revealed little of her true self to the public. In private, Jackie was said to have a wicked, mocking sense of humor. That's the Jackie I'd like to see, but she's not on display in this reverential biopic, whose idea of looking behind the veil consists of showing Jackie downing pills and drinking vodka and wine. No suggestions are made about assassination conspiracies, but there are vague allusions to JFK's now well-known womanizing: “He was imperfect, but he was perfect for our country,” Jackie says. “He went into the desert to be tempted by the devil, but he always came back to his beloved family.” A devout Catholic, Jackie is shown sharing her religious doubts with a trusted priest (John Hurt, his character listed only as The Priest in this Pilgrim's Progress of a cast list). The Priest provides homilies like “God is love, God is everywhere,” which gives Jackie scant comfort as she contemplates life as the world's most famous widow. The script, by Noah Oppenheim, is less interesting than the movie's technical alchemy: the production design, costumes, hair and especially the editing that seamlessly integrates live action and archival film, photographs and sound. 2 3/4 out of 4 stars.